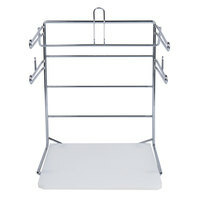 Designed to hold 1/6 size t-shirt bags, this Choice chrome t-shirt bag rack / stand is perfect for bagging items in your grocery, retail, or convenience store! It's also perfect in restaurants for bagging take-out food or a customer's leftovers. Opening plastic bags can be a hassle as the plastic can stick together. This stand makes it a breeze to open bags which will keep your restaurant or store efficient and timely. This t-shirt bag rack works well. It is sturdy and holds and dispenses bags easily. Buying from Webstaurant was definitely the best way to go about acquiring this item. through a sturdy rack holds a lot of bags. The base is great for loading. This never tips over and we love how it makes our use of the bags so perfect. The best way to display and open the t-shirt bags is with this stand. Very heavy duty and can be mounted to the wall or counter. A great buy. We have this t shirt bag stand in our to go area up front. It is tall enough to open up the bags to fill them with three square to go boxes. Perfect size!! Heavy duty and helps us in packaging orders. Holds all types of to go bags. Seems like it will last forever. Needs to be anchored down. The is the best product to maintain you carry out bags without the mess and keep it organized and minimize the wasteage, before without this rack my servers used to waste a lot of bags and kept the counter all messed up. Works as expected. Holds the 1/6 and 1/8 bags just fine. They are secure and allows us to pull off each bag. Holds about 4 packs of bags. This bag holder holds a good large amount of bags. Been using it for 3 yrs and have no problem. Sturdy and durable. Thank you! We didn't secure this to the wall like you can. It is just on a counter sitting and still works well. Used in a busy restaurant and helps us bagging up orders tremendously! This t-shirt bag rack is perfect for holding our t-shirt bags and allow quick and easy access when preparing to-go orders. Fits well under our order counter. Love it. It definitely does the job. I like how it has a bag hanger on the side for smaller bags too. I have 2 different sizes bags so it works perfect for me! We use this bag rack every day since day one at the restaurant. This is one of those items that you purchase and never have to worry about it again because of the quality of the item. Purchase this bag rack and go worry about something else. This bag Rag is the best product Is easy and light weight. The bags are easy to remove and is very handy. I can placed any where in my restaurant. I recommend this product to anyone. Easy, sturdy, holds up very well. Happy with this purchase. Has fit most sacks that I have purchased to try on it, so very happy with it. This T-shirt bag rack is great for holding bags and makes it easy to open bags quickly. This rack is very sturdy and stays up well! This is a standard t-shirt bag stand. Fumbling with plastic bags is reduced as the rack properly opens the next bag in line so you don't have to open each bag manually. This thing does exactly what it's supposed to... hold the bags up for easier loading. I bought to go under the counter by register, but was too tall. Still comes in handy for grabbing bags when needed. Hopefully I can expand my check out area and bring this up on top of the counter like it's supposed to be. Works nicely. Holds bags just as described. Good quality for the price. Doesn't take up a lot of space either. Would recommend buying here rather that other sites. Save money. Very easy to use. Only issue is the bags which we also buy from Web Restaurant don't have the side holes for attaching the handle part of the bags. Maybe we are not using correct but will figure out. Very sturdy. I love the glossy white base. Give the whole fancy look to my check out counter. FYI It can hold around 500 bags. Absolutely a life saver for packaging our salad boxes with soups and such. Only thing to watch out for is that your sleeve or apron doesn't catch the edge when walking past, lol. Love it! This is a good product. Has worked well with all types of t-shirt bags. I like that it can be hung up or set under a counter. Now that I have this I really like it. I used to just keep the bags in its box and shoved under the counter. But now I can load orders easier and i spend less money on bags because they get used versus tossed on the ground. Help keeps the TShirt bags under control and makes it easier for the staff person to vet the bag opened. Works Great and is worth the investment. Perfect size, heavy duty. Lightning Fast Shipping, ordered, shipped same day. Easy to load bags, quick n easy to pull off. Great buy, highly recommended! I wanted a rack/stand for our tshirt bags for easy bagging at our store. Overall it works great! At the moment it sits on top of our counter but I wanted one that I could have the option to mount which is possible. The only issue is that our 1/6 size tshirt bags fit a little low on even the highest hook of the rack. This is kind of a minor issue, but the bottom of the bags fold over onto the base which limits how many bags you can fit on the rack as it starts to crowd the base. But still a very small issue. Its still a very high quality choice at a great price and looks nice too! Good item. I could not find this item at my local restaurant stores. I think the price is pretty reasonable and it's very solid. Recommend it. I have bought this 3 times for my restaurants. Love the efficiency it provides with the to-go bags handling. Also it is very durable and can be fixed on the counter top. This is a very heavy duty bag rack. It looks great and has great durability. Overall a great product to purchase for your retail location. This is a must have item if you use t-shirt bags. Helps your shop to be more efficient and organize. And price and quality of this product are great! The perfect bag holder. The easy access to just pull and bag is the best thing for Pashays fast paced night. I will keep one in stock just incase this one gets worn over the years. these bag holders are heavy, which is good because i was trying to figure out how i was going to mount them temporally. But given how heavy they are i dont think i will have to do so. I think for what i plan on using them for it will work out just fine....they are not cheap or light there is weight to them...glad we got them for our book fair at the school...will make checking people out much faster. This is an excellent buy. As good as any you can find. I built a slide out shelf so we can save precious counter space. Excellent, sturdy t-shirt bag rack. We've used Velcro strips to secure the rack to the counter. The rack holds multiple bag types, without any issues. I love this. It keeps the bags neat on the counter and easy to bag things up. It is sturdy and I am ordering another one for sure! we love our shirt bag rack.. Bags are easy to fill and the stand bottom prevents bags from tearing away. so glad we ordered it. bought this for my small, mainly takeout restaurant where space is an issue. Works perfectly, very sturdy, and as compact as it could be. Awesome value! If your looking for one of these the look is over. Great for holding Togo Bags at any establishment. Easily separates the bags for faster service. Seems like it is very good quality, I haven't had any complaints about it yet,. I love this stand for the tshirt bags. You don't realize how much you need one until you get one! It's like have a spare set of hands! We have started doing quite a bit of take out and delivery. I saw this at the grocery store and thought why not use it to bag up our orders in the restaurant. Works really well. This item arrived very quickly and meets our expectations. It has different places for different size bags and is very sturdy. Easy to drill through the bottom and place wherever you need it. This T-Shirt Rack is very durable and sturdy. It is very high quality for the price and recommend. The stand makes it much easier for takeout orders. Works Great and doesn't take up a lot of room on the counter. Better than the previous option which was hanging the bags on a hook on the front of our counter. The heavy-duty design of this item makes it durable for a stand-alone use, not mounted to a register or wall. We used two of them for the take-out line at our church festival--made the process much quicker than picking at bags in a box! This stand is very durable and has held up for a number of years for us. We have several and use them for packaging to-go orders both at our restaurant and on our food truck. The base is a handy place to store extra bags, and the stand itself can hold several hundred bags at once. This is a great bag stand! It has a few different ways that you can install it in your store to accommodate any register situation. I also like that it has two different arms for different sized bags. Very helpful indeed! I would highly recommend this product, especially for the price! After searching many websites we found this bag rack and were excited at the price...THEN it was shipped quickly AND the quality was excellent. Some items are inferior once you get them. This is not true with the Webstaurant store. This stand has made bagging items at the farmers market so much better. Very sturdy and well made. Besides not folding up, it doesnt take up much more space then I thought it would. Well made product and you can not beat the price.. Shipping was low as normal and very fast. Once again the Webstaurant proved why I shop here first. My daughter insisted we get one of these, and this was the right choice. Easy to load and use, and since we can put stuff in the middle while transporting it, the rack doesn't add to our bulk when going to market. This is a very nicely made stand - I was initially thinking it seemed a bit expensive but it was well worth the money. The base is excellent - it a nice weight, is easy to clean, and does not move or slide around. I love the idea of getting it here cheap and sturdy. I wished I could have come across this along time ago I would have bought many more. I wish I would have had this stand from the beginning! Very easily holds several bags and keeps them secure while you load the customers items in the bag. These handy rack take up limited real estate at the cashier counter. The handles of the T-shirt bags hook unto the outer arms and have a center tab that hook, as a stack to the back of the rack. These tabs can tear off easily as a bunch accidently if you aren't careful. Bags can stick together too. Not perfect, but a great, affordable option. Can even be taken to events outdoors if that is part of your business. Our weekly take out business is booming and having the stand allows for the ease of bagging the take out containers rather than fighting with trying to open the bag with one hand and load the containers with the other. I never knew what an asset these little stands were. Very sturdy and looks nice at our front counter. Hint: we used Velcro to help hold it in place. My 1/6 size t shirt bags fit perfectly on this rack. It's not huge so it's not in my way and it saves you an extra pair of hands to put things inside. Nice standard bag rack! Easy to hook up hundreds of t-shirt bags! Nice for little food markets and even great for small to go restaurants that want to make it easier to grab a bag!! It's a bag stand. It works well for the bags we use. It's sturdy and looks nice. There's not much else to say about it. Price is about the same as other online retailers, but cheaper from Webstaurant when you factor in shipping. It is a very good bag rack , since it makes easier the retail sales. It will work on almost all t-shirts. I really recommend this item for retail business. Very nice and sturdy rack that fits a standard t-shirt bag. This isthe most economically priced model I was able to find by far. Great product! i am happy on the money i gave for this. very good investment. it seems it will last forever. it stays new all the time. This haves come in real handy for what we sell.It is strong and durabel for what we need as we do a lot of moving around. If you have any takeout food, you are going to need this product. It's a pain to use carryout bags and it takes too long to separate with anything else. This rack makes it easy to dispense tshirt size bags with ease.